Another Hope You Can Cling To Card for our card drive over at Splitcoast Stampers. The challenge today…using up those strips of paper that collect in our craft rooms. I keep all my misc. bits of paper right with the original 6 x 6 packs so that I can use them up. Each paper pad is stored upside down in a bin and that way I don’t lose all those little scraps. Works well for me. And it makes it really easy to thumb through a whole bunch of paper to find the right patterns and colors for a particular project. A win, win in my mind! All the strips were laid out and then I flipped them over and attached them to a piece of card stock. Next it was run through and embossing folder and sanded. Added a bit of sponging along the edges too! Die cut the banner and stamped it with the sentiment. I think this is such a great sentiment! 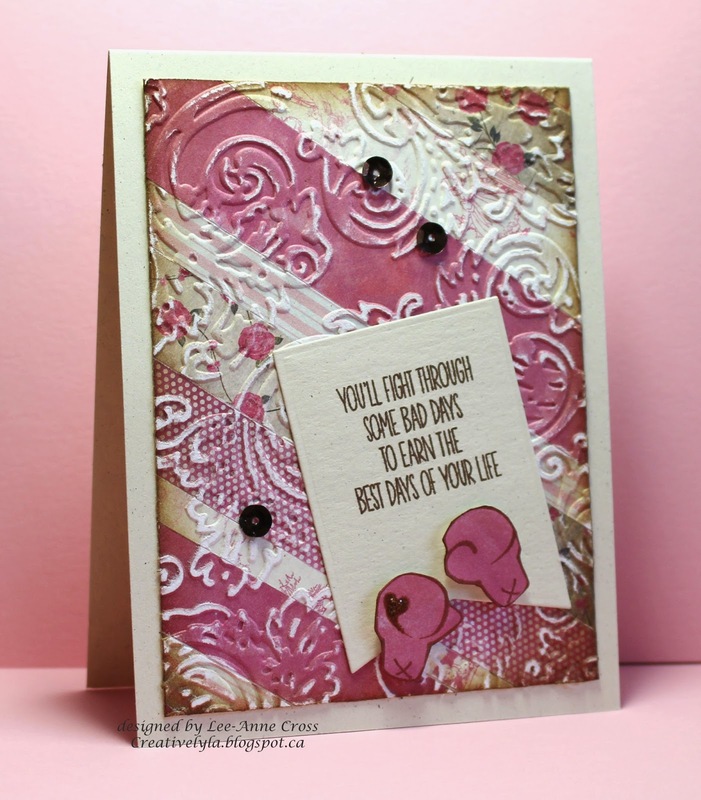 Then I stamped and fussy cut the cute little pink boxing gloves. They were popped up with dimensional foam. There’s also a wee bit of Stickles on the heart on the left glove and a smattering of sequins. This is spectacular Lee-Anne! Awesome way to use up scraps and the embossing and sanding look amazing! Fab inspiring card!